Major cabinet door manufacturer maintains quality by carefully controlling the moisture content of their wood. 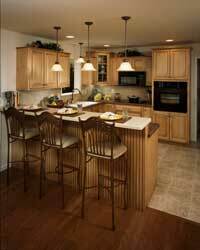 Conestoga Wood Specialties is one of the largest manufacturers of wood cabinet doors and drawer fronts. Thirty-seven thousand wood cabinet doors come off the lines every day at Conestoga Wood Specialtiesâ seven plants from Pennsylvania to Utah. Half the doors are sold by Conestogaâs OEM/Contract Division, which produces large orders for high volume customers. The other half come from the Custom Division, which fabricates single-set kitchens and caters to JIT manufacturers, routinely producing orders as small as a single piece. âWeâre dedicated to producing products of uncompromising quality,â says the companyâs corporate engineering manager. Throughout every step of the manufacturing process Conestoga pays attention to the finicky details of getting the job right. One important way Conestoga ensures consistent, high-quality products is careful moisture control of its wood, from raw wood through final shipping. Conestoga maintains its wood at 6 to 8 percent equilibrium moisture content throughout their facilities. The key to controlling moisture content is maintaining consistent relative humidity (RH) throughout the process. Conestoga receives kiln-dried lumber with 6 to 8 percent emc. Some time passes before every piece is used, but RH levels of 35 percent and more effectively maintain equilibrium and keep the wood at about 7 percent emc. When RH levels drop below 30 to 35 percent, even for a few hours, the wood will experience changes in moisture content that can cause manufacturing and quality problems. As a result, all Conestoga plants and warehouses are equipped with engineered humidification systems. These include compressed air-driven systems, centrifugal systems, and since 2006, high-pressure systems. All the systems provide humidity control, but some are more successful at precisely controlling operating and energy costs, and maintenance time and expense. Early in 2005, Conestoga engineers undertook an investigation of the latest options in engineered humidity control, including compressed-air, centrifugal and high-pressure systems. In 2006 it came time for Conestoga to install humidity control systems in their new 85,000 sq. ft. warehouse in East Earl, Pennsylvania and a new 115,000 sq. ft. plant in Tooele, Utah, which was built to support customers in the west. This wood working business selected engineered high-pressure humidification systems from ML System, through Husson Inc., MLâs exclusive North American distributor. âWe felt their high-pressure system would give us tighter, more precise moisture control end-to-end, with significantly lower energy and maintenance costs than any other option we looked at,â Conestoga engineers explain. The systems were installed in the East Earl warehouse in late 2006 and in the Tooele plant during the first quarter of 2007. The Tooele plantâs system includes 13 high-volume ML Princess 3 humidifiers in two zones, which are tied together with a programmable logic controller. Conestoga seeks to consistently control RH levels at 35 percent RH, Â±5 percent. One zone, which contains incoming wood and wood storage, uses five of the humidifiers to maintain tight emc control prior to manufacturing. The second zone, which has eight Princess 3 units, covers manufacturing and finished goods storage. Control of humidity levels during manufacturing is crucially important, since every cutting, planing, routing and sanding operation exposes the wood to opportunities for moisture loss and shrinkage. Humidity meters in each zone notify the programmable logic controller if RH drops below the 35 percent set point, and the Princess 3 units dispense a fan-driven cool mist of easily-absorbed microscopic droplets until the target RH is achieved. To reduce maintenance and avoid mineral dusting, the system includes an AQA Total 1500 water conditioner.